This recipe. Thiiiiiiiis recipe. Has created more excitement from friends and clients than any other thing I’ve made them as of late. Needless to say it’s pretty popular! I first made this cake a few weeks ago for a birthday brunch my boyfriend and I hosted. It was for my birthday…because the best present for me is cooking for the people I love! And this breakfast cake was the star of the show. I made the cake toward the end of the party and we all enjoyed this cake perfectly warm. The top was crunchy from the oat, hemp and turbinado sugar sprinkle. The middle was soft and springy from the almond flour and the berries burst with warmth and sweetness. Everyone, literally, everyone asked for the recipe at the end of the party. All my clients I’ve made this for since then have also asked for the recipe. We had friends in town last week and the slices barely last past our hellos. 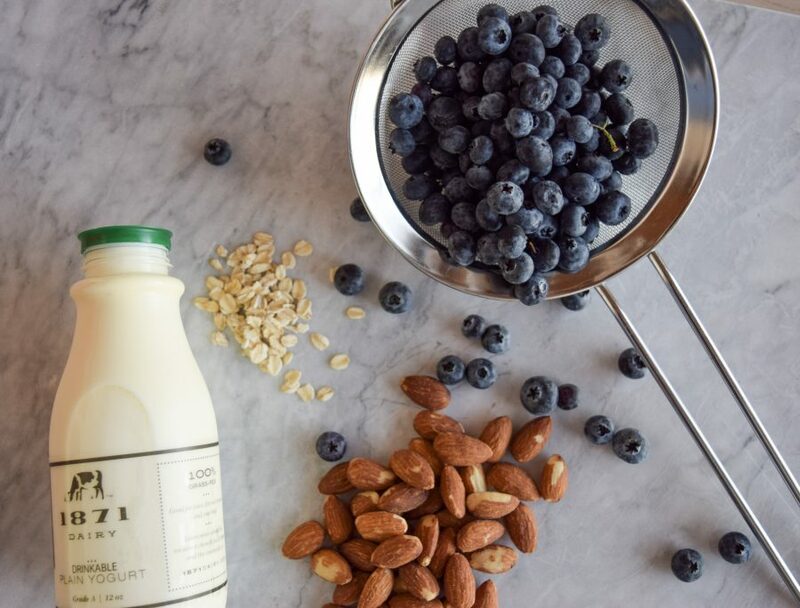 It’s simple, it’s delicious and it’s just the right time to use the last the season’s blueberries. 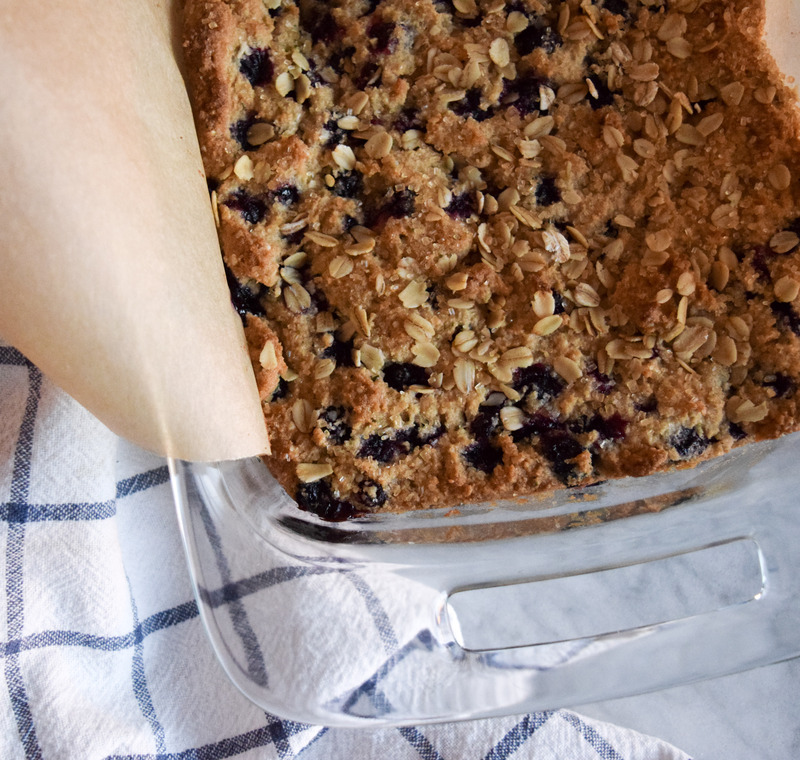 So grab the last of the blueberries this week (in the Midwest at least) and whip up a batch. It doesn’t need to be your birthday for you to enjoy this as much as I did! Preheat oven to 350. Line an 8×8 square baking pan with parchment paper and set aside. Add the softened butter, lemon zest and sugar to a medium bowl. With a hand mixer whip until fluffy and light in color, about 2 minutes. Add the egg and vanilla and whip until mixed in. In a small bowl mix together all but 2 T. of the quinoa flour, the almond flour, tapioca starch, guar gum, baking powder, sea salt, cinnamon and hemp seeds. Mix the blueberries with the remaining 2 T. quinoa flour. Set aside. Add the flour and yogurt, alternating, adding the flour in 3 parts and the yogurt in 2 (flour-yogurt-flour-yogurt-flour). Fold in the blueberries and mix with a spoon until combined. Spread evenly in the pan and top with the topping sprinkle. Bake at 350 for 35-40 minutes until golden brown and springy to the touch. Cool half an hour and enjoy!